Douglas Snelling was captivated by the vast ruins of Angkor Wat when he and his second wife Patricia visited Cambodia's ancient city in 1963. His artful photographs of the carved stone structures, crumbling under a jungle canopy of thick vines and trees, accompanied two enthusiastic articles he wrote for The Bulletin (Sydney, 7 November 1964) and Arts and Architecture (Los Angeles, July 1966). On that and later visits to Cambodia during the 1960s, the Snelling family became friendly with the country's then ruler, (Prince later King) Norodom Sihanouk. They stayed at some of the royal residences and adopted a young Cambodian boy in their Bellevue Hill house for several years, helping him to be educated in Australia as a companion of similar age to the Snellings' three sons and Patricia's daughter (by an earlier marriage). From 1970 until the Sihanouk monarchy was overthrown by Pol Pot's Khmer Rouge forces in 1972, Snelling promoted Cambodia's culture and trade potentials in his role as Honorary Royal Consul of Cambodia in Sydney (where the Snellings' home was the venue for diplomatic functions). 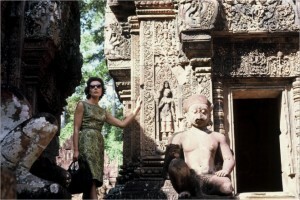 In 1974, Douglas and Patricia Snelling exhibited at the Australian Museum a large collection of rare Khmer antiquities – and Snelling's California friends Marion Dudek and Rex Crookshanks remember him as a regular trader of Cambodian carvings and artefacts, dealing with leading international Asian arts specialists based in Los Angeles. From our interviews with Snelling's family and friends, it is clear that Douglas did not feel guilty about his Cambodian acquisitions – although he would have been aware of the ongoing cultural battle between Greece and Britain over Lord Elgin's controversial removal of large and valuable marble sculptures from the Parthenon in Athens in the early 19th century (when Greece was controlled by an Ottoman sultan). 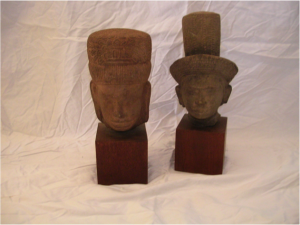 Snelling's ownership and trading of many small carved heads (which he mounted on square wooden blocks like museum artefacts) has never been questioned by any of Cambodia's governments. The Snelling artefact collection is now dispersed. Two calls to the Royal Embassy of Cambodia in Canberra have gone unanswered by the current Ambassador, His Excellency Mr Chum Sounry.